More than the initials on my business card, more than the notation on my resumé, it is the aspects of CEBS as a distinguished and cohesive profession that I have found most valuable. The Certified Employee Benefit Specialist program is focused and dynamic. The delivery is engaging. And where you want to go? You're going to get there faster. By providing your contact information you are agreeing to be contacted by us via e-mail, mail or phone. How Does Earning the CEBS Designation Help You? Employee benefits pros are having a tremendous impact on organizations. You want in the action? Of course you do. 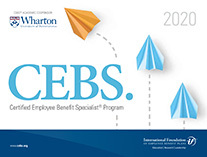 CEBS has always provided the university-caliber knowledge you need by partnering with the Wharton School of the University of Pennslyvania. Now you also get the application, the connections and the relationships, all career long. Check out the new curriculum at www.cebs.org.